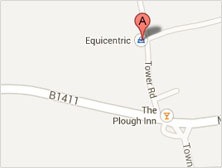 At Equicentric we like to make our customers feel special and because of this our website is just the beginning! Think of it as a 'window to our shop'. Although there is not a link to purchase online (apart from our 'special offers') please feel free to phone us on 01353 699909 to discuss your requirements, check availability and for that personal shopper experience. Our staff will happily help you and then process your order over the phone and post out to you. Ideally pop in and see us for a friendly chat over a cuppa and browse our fabulous stock in our beautiful shop. We love Equicentric and hope you will too!